Unique identifier for data and interactions. Many organisations – ranging from the Health Service to the local Building Society – are getting submerged in unconnected data collected from multiple touch-points. Whether it be the local GP, the health visitor, A&E or the out-patient clinic it is clearly desirable that there is a unique view (or a collection of linked data) on that particular patient. This should possibly also include the ambulance service and even the fire service so that they can get themselves prepared on their way to an emergency. 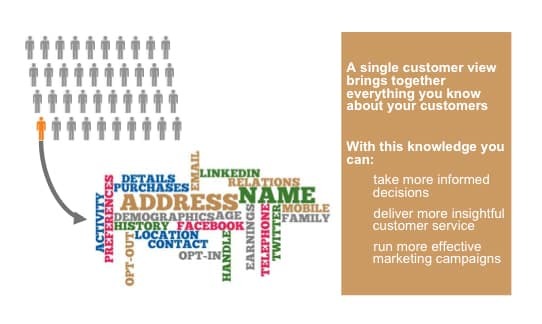 A Single Customer View (SCV) is also important for a large retailer with an online presence where the touch-points are their bricks-&-mortar shop, their online shop, their call centre and their many on-line channels. They all require joined-up-thinking, and this calls for a Single Customer View. One of the main difficulties in achieving an SCV is that the data is often in both different structures and formats so a key component on the way towards an SCV is data standardisation with which CSM has many years of experience.